Bayern Munich reigned supreme in their second leg tie as the German side smashed seven goals past 10 men Shakhtar Donetsk at the Allianz Arena. The always raucous Allianz Arena fueled up in anticipation of what they hoped would be a much improved performance from Bayern Munich after the German side were frustratingly held to a stalemate away at Shakhtar in their first meeting. The away side were dealt with a massive blow not even five minutes in. Gotze, in the area was clumsily fouled by a wreckless Kucher who received an immediate red. Huge psychological blow for Shakhtar; and Muller added to their early woes as the German sweetly struck home to draw his side first blood. Bayern followed up their pressurized start with tight play around Shakhtar's area with attackers drifting in and out; patiently breaking the away side's defence down. Guardiola's men almost doubled their lead inside ten minutes. Lewandowski blistered past Rakitskiy down the left, and drifting into the area he dashed a low lay-off across the face of goal. Agonizingly for the home side; Robben failed to poke home from close range. Due to their early defensive disruptions; Shakhtar replaced attacking midfielder Taison with defender Kryvtsov to fill the gap Kucher left following his dismissal. For the first time in the game, Shakhtar broke centrally into Bayern's half with defenders in sleep mode. Unfortunately for Fred he required sizable energy and pace to drive away from the half way line. Doing the very best he could wasn't good enough as a determined Boateng clattered into the striker with a brilliant challenge; thus easily dispossessing Fred. An unfortunate injury occurred for star winger Robben who was replaced with no hesitation due to a suspected hamstring niggle. Understandable substitution as there was no need for Guardiola to take a risk with a player of the Dutchman's caliber. A second goal had been looming ever since Bayern's first and it almost came. Rafinha dashed a looping ball over to an unmarked Lewandowski at the back post. The Pole drifted into a more central position and with the ball still traveling he latched his head onto the delivery, however he could only watch on as the agonizingly effort smashed onto the woodwork. With already half an hour gone, there wasn't a glimmer of hope for an already beaten Shakhtar side who even found it difficult departing their own half. Bayern continued to close in on a second goal which had been looking very likely. Ribery came close as the dazzling footwork of the Frenchman fooled Shakhtar defenders with sheer class. He rammed a left-footed strike at goal; with Pyatov thankfully thwarting the Bayern winger down low. Shakhtar's dreaded dreams of conceding a second before half time finally occurred. Muller initially started the move with a simple cushioned knock down to Lewandowski who fired a flat effort at goal. Parried away by Pyatov, the Shakhtar goalkeeper could only helplessly watch on from the ground as Boateng, from 2 yards slotted home to double Bayern's lead to 2-0. Calls for a second red for Shakhtar rang loud and clear inside the Allianz after Ribery fell to ground claiming that Costa elbowed him in the head. Players from both sides rushed to the scene, with referee William Collum handing yellow cards out to the culprit and Boateng for his angry reaction. Bayern continued to dominate possession in all areas; not allowing Shakhtar to even break out of their own half on many occasions. When they did, Guardiola's solid defenders blocked out almost everything. The referee blew his whistle for half time as the home side departed the pitch carrying great confidence. They had dominated almost every minute, excluding faint moves forward for Shakhtar who, for a start, had to figure out a way to climb out of their own half in the second period. It was evident from Muller's early goal that Shakhtar had a long, grueling night ahead. Matters became even worse for the away side when Ribery thumped a third home. The Frenchman played a clever one-two passing sequence with Boateng up top, and when receiving the ball he curled a terrific low strike into the bottom right hand corner. No chance for Pyatov in goal. If the visitors weren't already embarrassed by being completely dominated and pinned in their own half then they certainly were when Muller hit a fourth. The dazzling Ribery scorched down towards the left byline and lashed a low ball across the face of goal. Pyatov knocked it away, only as far as Muller who retrieved possession and curled a composed strike home from close range. Despite the pure annihilation; Shakhtar still gave the game every ounce of effort they had. Teixeira, Costa and Fred linked up down the left flank where Shevchuk retrieved possession and blistered forward. He crossed into the middle where Adriano looked set to score, however his poked effort was vitally blocked by Badstuber. 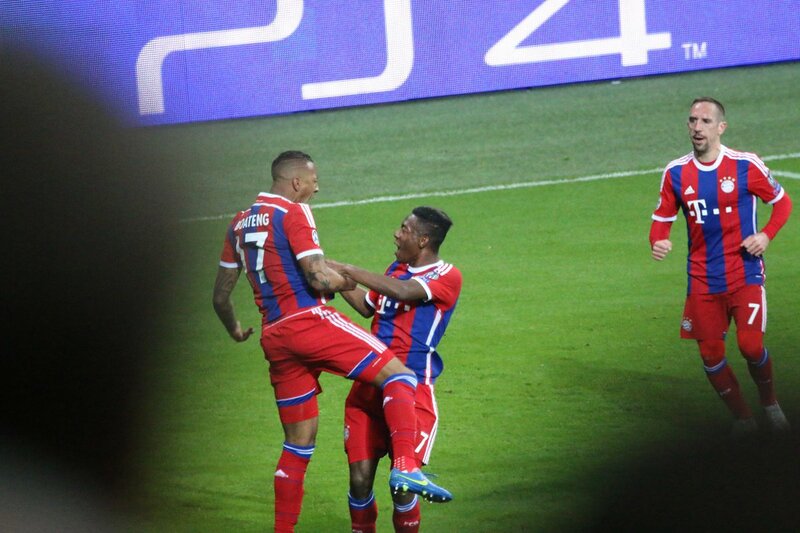 Jerome Boateng had already put himself on the sizable score sheet and yet another defender did too. With players still loitering in the box following Bayern's corner, Rafinha blasted a sharp cross in the area where Badstuber would escape his marker and plant a header past Pyatov at his near post. Shakhtar's early sending off had been a real problem for them and this goal proved exactly why. With only 20 minutes remaining, Bayern clearly felt no need to charge forward and look for more goals. Crisp passing around the park, further frustrating Shakhtar was their plan as the Allianz Arena continued to make tons of noise. After two defenders had put themselves on the score sheet; it was only natural for Lewandowski to add himself on too. The Pole lacked killer instinct all game long, however he finally grabbed a goal. Shakhtar, looking to disrupt Bayern's passing momentum played a high defensive line and payed the price. A long ball looped over their line where Lewandowski would latch onto it, take a few touches and tuck a low strike past Pyatov into the bottom left hand corner. Shakhtar had absolutely nothing to play for, and Bayern picked them off at ease. Muller almost grabbed his hat-trick. Rafinha crossed low into the area, however the German's shot agonizingly struck the side netting. Proceedings were well and truly put to bed as far as Shakhtar were concerned. They had conceded a staggering six goals, however one more was to be added as Gotze grabbed one late on. He struck home from close range; further emphasizing Bayern's pure dominance as referee William Collum concluded proceedings after a brutal hammering of Shakhtar. Bayern Munich were terrific tonight. They completely dominated Shakhtar Donetsk, something Guardiola's men failed to do in the first leg. Bayern's hopes of potentially reaching the Champions League final are looking healthy. 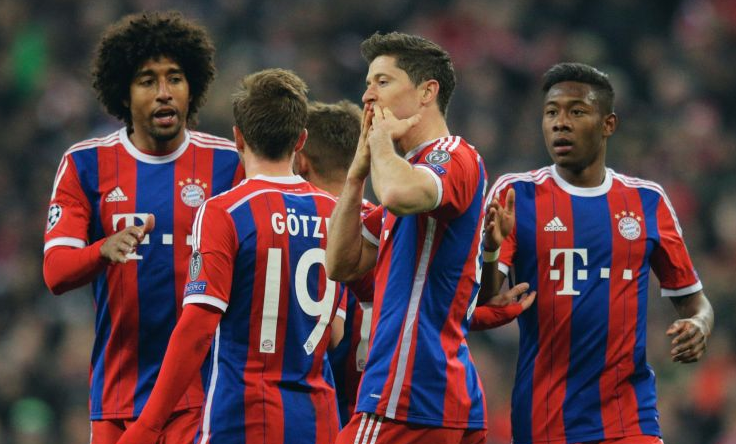 Bayern thump seven goals to emphatically top Shakhtar Donetsk. Match report for Champions League clash.